Answers to your important questions about taking your child to the dentist. Have you wondered when it’s best to begin taking your child to the dentist? Are you nervous that your child may be scared or uncooperative? Is a pediatric dentist different from a general dentist? Early dental health care is very important for your child. Children today are five times more likely to get a dental infection than contracting asthma, and seven times more like to contract an infection than to catch hay fever! You may have some questions about dental pediatrics. Here, we will answer the big questions and give you all the pediatric dentistry information you need! Pediatric dentistry is the branch of dental care that focuses on patients from infancy to teenage years. Pediatric dentists make sure that a child’s baby teeth are free of early disease and oral decay that can cause long-term harm. Pediatric dentists perform exams and cleanings as well as X-rays, cavity repairs, sealant applications, orthodontics and any other dental procedure that will help protect your child’s teeth from bacteria and decay. Pediatric dentists provide age-appropriate treatments for your child during all stages of their development from their baby to adult teeth. Pediatric dentists will work with you to educate your child about the importance of maintaining good oral hygiene. They will demonstrate proper brushing and flossing techniques and will work with you to create healthy habits at home that will help to ensure oral and overall health for your entire family. On the first visit, either the dentist or hygienist will first make sure your child is comfortable. They will sit them on a table or in your lap, depending on your child’s age and what you and your child prefer. The pediatric dental professional will then likely start with a general examination and gentle cleaning of the teeth with something like a wet toothbrush. They will also most likely ask you and your child about their dental habits, and about other habits such as thumb-sucking and how much fluoride they get through their diet. X-rays and other more advanced procedures will likely be left for future visits. When should I begin taking my child to a pediatric dentist, and how often after that? The first visit should usually be when your child’s first tooth grows in. While this is a good policy in general, you should aim to schedule their first appointment around their first birthday, even if you haven’t seen any teeth yet. Repeat pediatrics dental visits should be, on average, every six months. Your chosen professional may set a different schedule based on your child’s needs, so be sure to check with them. 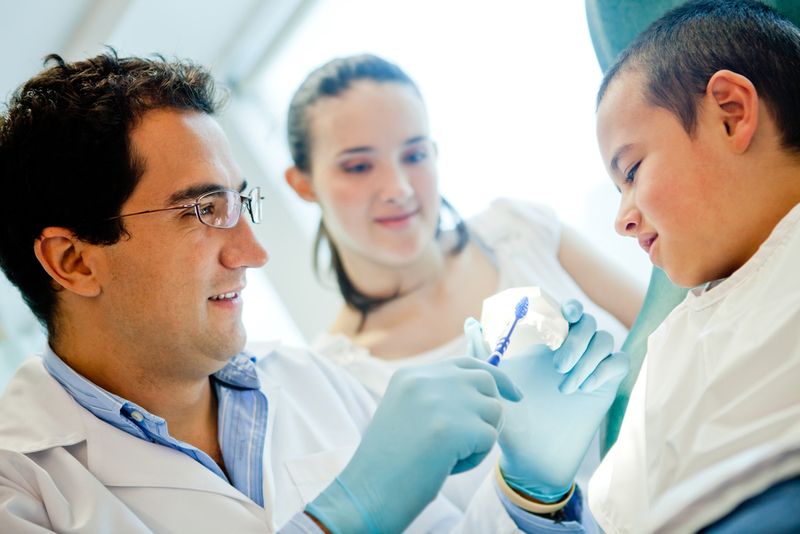 What is the best way to find a pediatric dentist? There are a number of online resources you can consult. Check with your local dental assistance programs like the Children’s Health Insurance Program for guidance. You can also check with online registries to help find the best pediatric dentist near you. If you live in Philadelphia or the surrounding region, consider the affordable, high-quality services offered by the expert student doctors at Penn Dental Medicine, the teaching clinic of the University of Pennsylvania School of Dental Medicine. 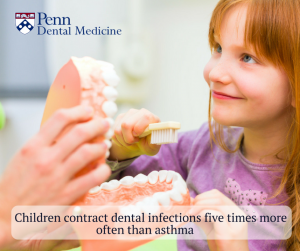 If you’d like more information about pediatric dentistry or to schedule an appointment for your child, contact Penn Dental Medicine at 215-898-8965.